Trailer: "Sarantario, The Mountain of Temptation"
Is the New Testament Forged? Movie: Dostoevsky's "The Grand Inquisitor"
What Could Orthodox Christians Say To New Agers? Monks are by nature introspective creatures. We turn inward in prayer in order to meet our Savior. We also try to stay active in mind and body. We turn to serve our brother in love and in so doing we encounter our Lord once again. The union of theoria and praxis, thought and action, makes for a joyous monastic life. Sometimes, however, sincere monastics get bogged down and their lives seem quite different from what is described in the lives of the Saints and books by contemporary luminaries. Critical thoughts take hold of our minds and sluggishness characterizes actions that should be a source of joy and gladness. What goes wrong? Certainly, a large part of the answer to this question lies in the passions and the providential withdraw of divine grace. But perhaps, another part of the answer can be found in the monk’s personal history, tendencies, and vulnerabilities that made up his personality long before entering the monastery. In that case, might a contemporary school of psychotherapy, grounded in empirical study and focused on cognition and behavior have something important to say? With that introduction in place, I should mention that I have been an Orthodox monk for nearly twenty-five years. I lived on the Holy Mountain for a decade during which time I got to know some wonderful fathers who tasted the most sweet fruits of the prayer of the heart and intimate communion with Christ. I also encountered novices and monks discouraged by the struggle and wondering why those same fruits seemed beyond their reach. I saw acts of self-sacrifice and love that moved me deeply. I also was saddened to see others who were so obsessed with certain thoughts that they missed opportunities to serve their brethren and although they desired to act virtuously and to love sincerely, insecurities, feelings of inferiority, and suspicions compelled them to react in ways that they themselves deplored. My heart went out to those monastics. I prayed for them, but what else could I do? While at the Monastery of Karakallou on the Holy Mountain, I came across the works of the influential spiritual father, Father Simeon Kragiopoulos. In his Do You Know Yourself? [in Greek], he offered a Christian Orthodox reading of Karen Horney’s Our Inner Conflicts. In this and other works by Fr. Simeon, he suggests that certain psychological problems can prevent a person from progressing in the Christian life and need to be resolved so that the Fathers’ teachings can be received and applied in a way that is salutary and salvific. This suggestion was the seed for Ancient Christian Wisdom and Aaron Beck’s Cognitive Therapy: A Meeting of Minds, but in the full life of an Athonite Monastery, I lacked the time for any serious exploration of such topics. In 2005, when I was sent to celebrate the liturgical services at a dependency of Karakallou, the Monastery of Saint Demetrius at Nea Kerdyllia, I developed a heart condition that made it impossible for me to return to the Holy Mountain and follow the way of life there. With more time on my hands and in order to avoid idleness, that mother of the vices, I decided with my Elder’s blessing to begin to explore the teachings of the Church Fathers and modern psychologists on the thoughts. I was already quite familiar with traditional ascetic literature such as The Philokalia, The Ladder of St. John Climacus, The Homilies of Saint Isaac the Syrian, and other holy fathers as well as the writings of contemporary elders, in particular the Elder Paisios who repeatedly emphasized the need for good thoughts [logismoi]. Psychology was at the time an unexplored terrain that I had been somewhat suspicious of in the past. 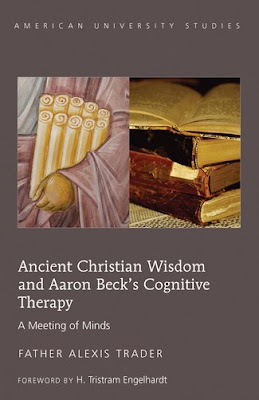 After reading the works of Karen Horney, Harry Stack Sullivan, Eric Erickson, Sigmund Freud, Victor Frankl, Albert Bandura and others, I came across the works of Aaron Beck. What struck me concerning this final figure was that Beck’s works were simply an application of the scientific method to thoughts and behavior without an inordinate amount of esoteric theories around nebulous concepts. His ideas could be observed, tested, and verified easily in day-to-day life. I should mention that I was originally trained in the hard sciences before becoming a monk and Beck’s approach meshed well with my scientific background. So my thinking went if I could find a way to connect Beck’s insights with those of the Fathers, I would have something valuable to offer spiritual fathers and those who are suffering. Thus inspired, I began reading more intently, researching more extensively, and praying more earnestly until I had about 5,000 note cards (As a writer, I am rather old school) with citations from the Fathers and cognitive therapists on mental/spiritual health. As I sorted and sifted, an amazing amount of common ground began to emerge and I could see the framework of a book taking shape. In order to make sure that I would not stray from the Fathers’ teachings, I contacted Professor Anestis Keselopoulos, a specialist in the writings of Saint Gregory Palamas and author of the book, Passions and the Virtues, which I had translated many years earlier. Realizing the dangers of trusting in one’s own judgments and opinions, I wanted to pass every chapter that I would write by him. And so the book also became a doctoral dissertation. Professor Keselopoulos was very enthusiastic about the work as were the other six professors present at the defense, including specialists in psychiatry, dogmatics, pastoral counseling, patristics, and the interface between Christianity and culture. They all were emphatic that this dissertation should not only be published in book-form and enter the university libraries of the West but also find its way into the hands of pastors and counselors helping those who suffer. Peter Lang International Academic Publishing Group has now published this work, which can be ordered from Amazon: http://www.amazon.com/dp/1433113627. (For those unfamiliar with academic presses that produce a limited number of monographs for university libraries, the book will unfortunately seem rather expensive. I would encourage those who wish to read the book, but find it outside their budget, to approach their local college or public library about the possibility of purchasing it. Perhaps, groups of five could purchase it as a donation for their parish library or the pastor’s library. If the hardbound copies sell well, a less expensive paperback may be on the way).